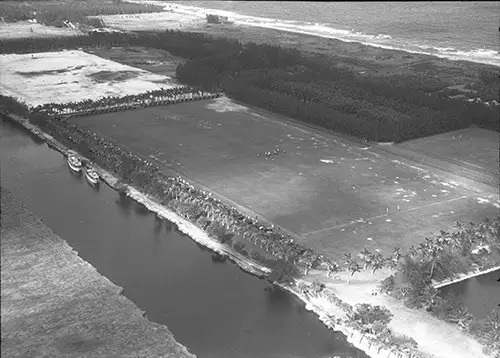 Polo game about to take place at Gulf Stream, Florida, east of the “Florida East Coast Canal” (later called the “Atlantic Intracoastal Waterway” in 1929 and thereafter, and west of the Atlantic Ocean). Courtesy, Southern Methodist University, Dallas, Texas; Robert Yarnall Richie Collection. Located in Palm Beach County, the Town of Gulf Stream was founded in 1925 by the Phipps family (U.S. Steel, with Andrew Carnegie), the Uihlein family (Schlitz Brewing) et al. interested in polo and golf. Today, the Town of Gulf Stream has by some measures the 11th or 14th highest per family income in the country. Its estimated population is 826. A member of the Uihlein family, Dr. Alfred Uihlein, Mayo Clinic, Rochester, Minn.,performed a lifesaving procedure upon the author of this post shortly after birth in 1950. Uihlein served as a pro bono professor of neurosurgery at the University of Minnesota, Rochester, for many years. This entry was posted in Uncategorized on September 6, 2015 by Florida's Big Dig.